I screwed up; yes, it’s true, I screwed up. Who would have known, someone actually followed my instructions for doing preventive maintenance around their home and I happened to leave out a simple piece of information. I will be the first to admit, I don’t always follow my own recommendations for home maintenance. I am no different from my dentist friend, who recommends flossing and doesn't do it himself. I've seen the high number of visitors, on the most popular page on my website, “My Home Doctor”, spend an average of five minutes reading content that is all about helpful hints to guide you in the right direction when doing home maintenance. I once appeared on our local TV station, during the evening news, giving advice on what to do when buying vacant homes that has been sitting idle for years and yet I screwed up and left out a sort of important procedure when applying preventative maintenance to plumbing fixtures. I assumed those who visited my website, understood where the important disconnects to your home were before you started doing maintenance; I was wrong. It all started when, someone was trying to be a responsible homeowner and stay ahead of the maintenance by checking the shutoff valves to the sinks and toilets. The owner applied to much pressure to a frozen valve and snapped the PVC pipe it was connected to and they had no idea of where the main shutoff valve to the home was located. After several phone calls to plumber’s answering service, (it was a Saturday afternoon), they found a plumber who talked them through the process of how to locate the shutoff as the water was now flowing out the front door. 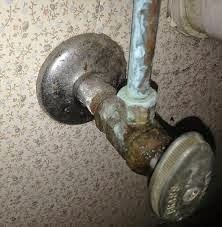 What the plumber assumed, the home owner knew they needed a tool to manipulate the valve; he as wrong. After the homeowner located an adjustable wrench and screwdriver to be able to turn the main shutoff valve, the water had flooded the entire house. The good news, they were insured, the bad news; they probably won’t be calling me for the restoration. So here is a note to myself; write step by step instructions when writing tips, but then again, most guys won’t read them anyway.